It's time to bring out the summer furniture and accessories! This week I got to dig through storage and unearth some of my favorites. I brought these lanterns out for the back patio. My mother-in-law gave them to me last summer. They have such a beautiful classic style, and the etched blue glass is just lovely with candlelight coming through. They look old yet the warning tags on the bottoms tell a more modern story. They look right at home on the back porch overlooking the coops and woods. Make your own & post how. I made some last year, but something went terribly wrong...The smell everything & everyone run far, far away. Oh my gosh I love those! Lots of rain here over the weekend! Thanks! I really like them too. Unfortunately it's only sprinkled here and there....was hoping for more. Wow they are beautiful! I am kind of lazy, I leave my outdoor furnishings on the patio. It is covered so the weather wont hurt it. Besides, our winters are pretty mild so I do get a chance to use it a bit in the cooler months as well. If I could get away with leaving our furniture out all winter, I would too! Unfortunately the roof isn't big enough to keep it protected. It get's pretty snowy here too. Saw your link on The Creative HomeAcre Hop. Love these lanterns, the color is amazing! Thanks! I love the color too! I love the lanterns. Blue is my favorite color so they really caught my eye. Thanks! The blue is so vibrant too! Not at all washed out. I can't wait to use them! What a gorgeous yard you have and those lanterns are incredible, love the shape and color,nice mil giving them to you. Whenever I see a yard like yours I miss our yards in KY, MT also. Will you be making your own citronella candles? Hope you'll do a tutorial/post on making them. I can't stand the smell of them as citronella gives me a massive headache but they are handy. I love getting our deck all cleaned up, the chairs/table and get the umbrella out. Sat our on deck today enjoying the shade from the umbrella. Back of our house faces west so it gets super toasty in afternoon. I have a rug I could put out there but think I'm going to make one with a drop cloth, more fun and lot less expensive. We live in western CO about 18 miles west of Grand Junction, out in country. Saw your post thru the Creative HomeAcre Hope. Love those hops as I find so many incredible blogs and posts, yours especially. Hope you're enjoying your beautiful back yard today. The hops are great! I spend hours reading the posts! 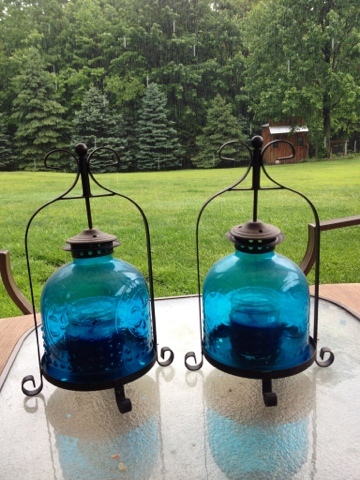 Love the blue of your lanterns and they do have a vintage style. They do! I was actually surprised to see the modern warning sticker on them. Thanks for stopping by! The blue glass is so lovely!